Option 1: Take I-94 East to I-43 North and use exit 73A McKinley Avenue. Merge right onto eastbound McKinley Avenue to 5th Street. Turn right on 5th Street and proceed to W Juneau Avenue. The main entrance to the arena will be one block left and a right onto 4th street. Option 2: Take I-94 East to I-43 North. Take exit 72C through the Kilbourn Avenue tunnel. At the first set of lights turn left onto 6th Street and proceed 2 blocks north. The entrance to the Arena will be on your right-hand side. Option 1: From I-43 South take exit 72E to 11th Street and proceed south to State Street. Turn left onto State Street. Proceed five blocks east to 6th Street and turn left. Take 6th street 3 blocks and turn right onto McKinley Avenue. Proceed to 5th street and make a right. Proceed one block to W Juneau Avenue. The main entrance to the arena will be one block left and a right onto 4th street. Option 2: From I-43 South, take exit 73A to McKinley Avenue. Turn left and proceed east on McKinley to 3rd Street. Turn right on 3rd Street and proceed to W Juneau Avenue. Turn right on W Juneau Avenue and proceed west to the arena entrance. Option 1: Take I-43 North to exit 73A onto McKinley Avenue. Merge right onto eastbound McKinley Avenue to 5th Street. Turn right on 5th Street and proceed to W Juneau Avenue. The main entrance to the arena will be one block left and a right onto 4th street. 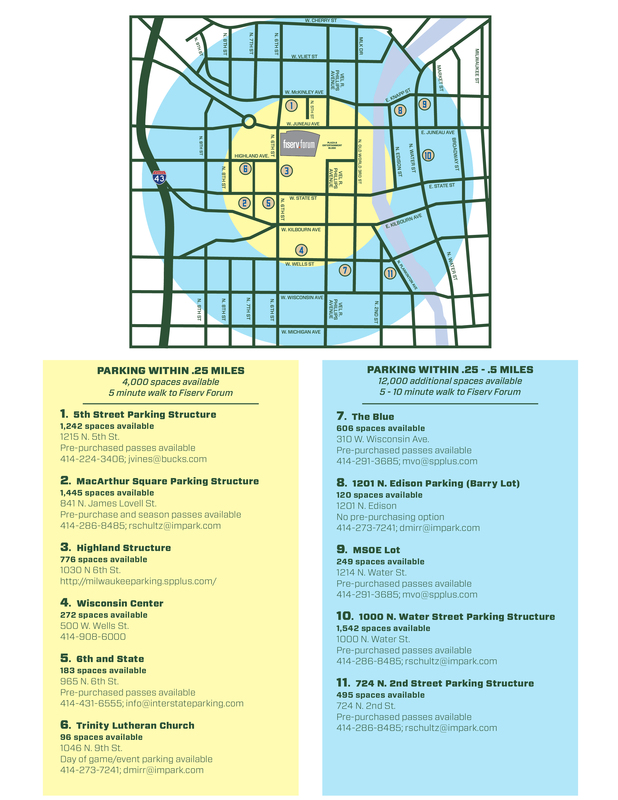 The 5th Street Parking Structure is located at 1215 North 5th Street, Milwaukee, WI 53203, and can only be accessed from McKinley Avenue. You are able to park in the secured structure 24 hours a day, seven days a week. If you would like long-term parking, monthly rates are also available. There is ADA parking available throughout the garage. Please follow the instructions of the parking attendants to access these spaces. I have an oversized vehicle, will it fit in the parking structure? Please review the map below for additional parking options. Pre-purchase passes are available at select lots. Please contact parking vendors directly to purchase.